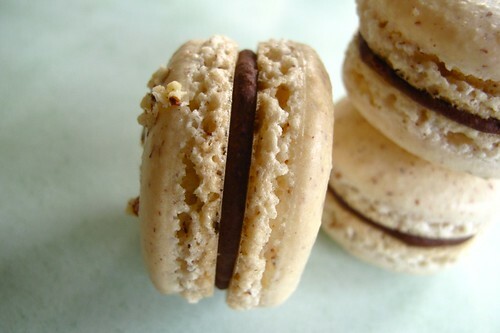 One of my latest macaron creations were these Hazelnut Praline Macarons. 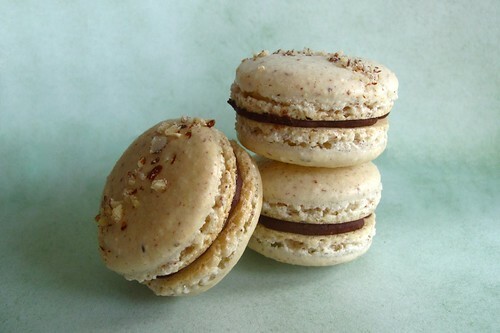 I love the combination of hazelnuts with chocolate and I love macarons so this combination was an obvious success. 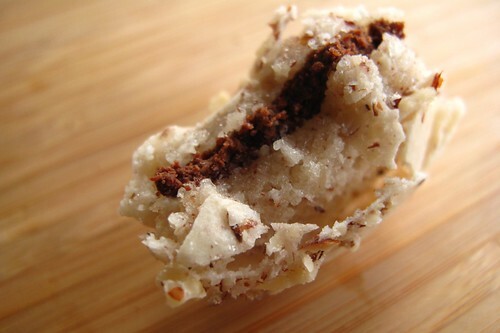 The filling tasted a little like Nutella, yet with a delicious hint of caramelized sugar that comes with pralines. 3. Cover roasted hazelnuts with a tea towel and let them steam and cool down for 10 minutes. Roll them around in the tea towel and the skins should come off easily--a little bit of skin left on them is fine. Transfer them to a baking sheet lined with silpat. 4. Combine sugar and water in a small saucepan over medium high heat until the sugar dissolves and turns a dark amber color. Watch this carefully because the sugar mixture can go from caramelized to burn in the blink of an eye. If using a candy thermometer, cooked until it reaches around 350 degrees. However, you can easily tell when it's done by the color of the sugar. 5. Pour the cooked sugar over the hazelnuts and let cool. 6. Once cool, break the sugar and hazelnuts into pieces and process in a food processor until finely ground. 7. Make a chocolate ganache by heating up heavy cream and pouring it over milk chocolate pieces--I eyed the amount so I apologize for not having an exact measurement. 8. Mix in some of the praline into the milk chocolate ganache and chill in refrigerator before filling shells. 1. Start by aging the egg whites on the kitchen counter at least 24 hours before you plan on making the macarons. 2. Weigh out the appropriate amounts of blanched almond silvers, raw hazelnuts, and powdered sugar. I left the skins on the hazelnuts and I think it made a nice speckled look for the shells. 3. Combine the nuts and powdered sugar in a food process and process until finely ground. Sift the mixture and regrind the pieces that are bigger. 4. Whip the egg whites until frothy and add the granulated sugar in little by little until it forms stiff peaks. 5. Fold the nut and sugar mixture into the meringue in two parts. Fold just until the mixture reaches the consistency of molten lava and falls back onto itself in thick ribbons. For me, this occurs almost as soon as the egg whites are no longer distinguishable. 6. Line two baking sheets with silpat and pipe the batter into 1 inch rounds. The batter will spread a little so don't make them too big or too close together. Decorate with chopped hazelnut pieces if desired. 7. Preheat the oven to 280 degrees F. Let the piped macaron shells sit on the counter for 30 minutes, or until the surfaces are dry. 9. 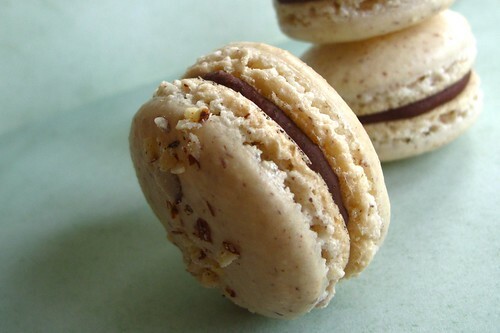 Fill the shells with the praline filling and let them "mature" in the refrigerator overnight to achieve the perfect macaron consistency. 10. Enjoy with a cup of coffee! damn girl, that looks divine! !